COPE Galway has achieved a national quality standard in volunteer management and is proud to celebrate becoming an Investing in Volunteers (IiV) achiever – a first for the West of Ireland. The local charity’s volunteers will come together at an event to accept the award from Volunteer Ireland at 6.30pm on Thursday, 24th January at the Galway City Museum. Investing in Volunteers is delivered in the Republic of Ireland by Volunteer Ireland in partnership with Volunteer Now in Northern Ireland. The only standard quality mark to focus on volunteers, it is based on four areas of volunteer management: planning for volunteer involvement, recruiting volunteers, selecting and matching volunteers and supporting and retaining volunteers. COPE Galway was assessed against a range of best practice standards in August 2018. The audit involved meeting with over 30 volunteers, Board Members and Staff. COPE Galway proved to excel in all aspects of working with its volunteers and attained its quality mark standard on 28th October 2018. If you would like to volunteer with COPE Galway, visit www.copegalway.ie/get-involved/ or contact Lucia Canavan, Volunteer Coordinator at volunteer@copegalway.ie . Telephone 091-778750. Photo of Senan Quain, mentioned in news release. 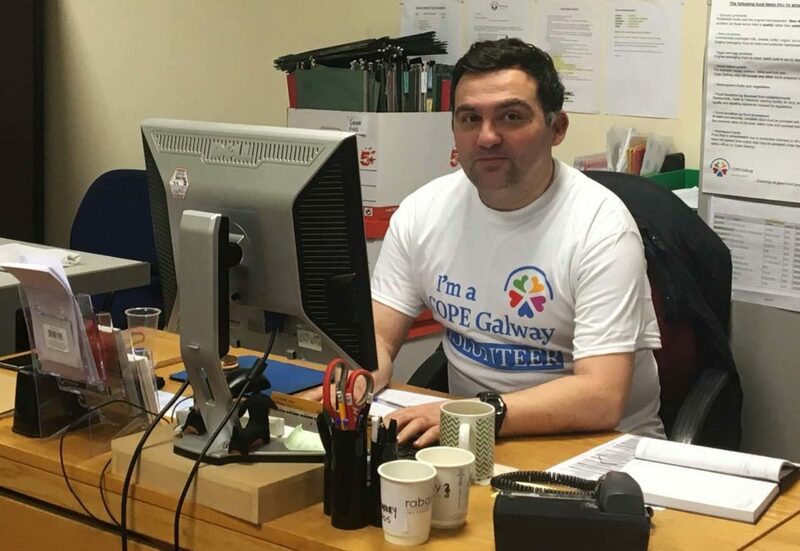 Senan Quain, one of COPE Galway’s 220-strong team of volunteers who offer help across the organisation’s services for Homelessness, Domestic Abuse and Senior Support. The local charity will be accepting an award from Volunteer Ireland for achieving a national quality standard in volunteer management, Investing in Volunteers, at an event at the Galway City Museum on Thursday, 24th January. A selection of interviews conducted with volunteers and photos are available if you wish to include with this release – please contact Colette Coughlan – 091 778750. COPE Galway is a local Galway Organisation whose vision is an “Improved Quality of Life in a Home of your Own” for people affected by homelessness, women and children experiencing domestic abuse, and older people. The Charity offers multiple volunteering positions across its services in over 30 roles. From meal delivery drivers, food rescuers, kitchen assistants and cookery tutors, to positions as a befriender or playroom support, a shop assistant or a musician; helping out at the Day Centre & Lunch Clubs, or with administration and more. The organisation also has people who help out on an occasional basis at fundraising events and on short term corporate Helping Hands Projects, which offer a team-building helping hand to services to get practical work done, such as painting a client’s home; planting gardens or washing windows. For further information about the Investing in Volunteers Standard programme please contact Volunteer Ireland on info@volunteerireland.ie or visit www.investinginvolunteers.org.uk.